November 11 Theresa’s mother, Susanna Meyer born in Baden, daughter of Richard and Susanna. This information was gathered from Susanna’s death certificate. October 31 Leopold Leicht, Theresa’s father, born in Baden, son of Fidel. this information was gathered from Leopold’s death certificate. According to Theresa’s Bible, her parents were married in New York but no records could be found . According to her mother’s death certificate Susanna came to American in 1845. Carl Leicht, Theresa’s brother is born in New York. Just a short nine years before the 1860 census, the New York City Guide describes one of the main streets in Theresa’s neighborhood (the 20th Ward) as “ a winding road through pleasant countryside (NYCG p146)”. However with the coming of the Hudson River Railroad in 1851 and the building of a station at Thirtieth Street and Eleventh Ave the area changed dramatically. At approximately the same time another Railroad commenced building a line between Chambers Street and Fifty First Street. These railroads helped lay the groundwork for the northward march of the city in the years before the Civil War. It seems that Susanna, Leopold and their young family were living in the midst of rapid development. March 9 Theresa’s father purchased 529 Ninth Avenue (Lot 34) on block 737, between 39th and 40th Street. June 8 Theresa’s father purchased 531 Ninth Ave (lot 35) on block 737, between 39th and 49th Street. According to the New York City directory for 1863-63: Leicht, Leopold, furniture, 530 Eighth ave.
July 11 draft riots broke out in New York City. These riots were the worst civil disorder the United States had ever seen….and many of the riots occurred in the same neighborhood in which the Leicht family lived. On Monday, the first day of the riots, thousands of workers marched down 11th Ave in the 20th ward. July 11-15 In the days that followed a barricade was set up by the rioters on 9th Ave from 36th to around 42th Street. “ Telegraph poles were cut down and laid across the avenue, and carts, wagons, lumber, boxes. bricks, rubbish healed on top (Armies of the Streets, Cook p. 126)” The path of this barricade lay right in front of the property owned by Leopold Leicht. Although his business was located at the time one block east at 530 Eight Ave, the riots must have effected the young family deeply. According to the New York City directory for 1864-65: Leicht, Leopold, upholsterer, 530 Eight av. h. 481 Ninth ave.
All business was suspended. Thirteen year old, Theresa and her brothers surely went to this procession. Jan 13 The East River running between Manhattan and Brooklyn froze. For a short while it was possible to walk from New York to Brooklyn. Theresa’s grandson, my uncle Fred talked about this. His grandmother must have told him the stories about the event from her childhood. She was 15 years old at the time. Or perhaps, he heard the story from his father’s mother, Rosa Behman Schnaupauff who was a young girl living in Brooklyn at the same time. June 27 404 West 40th Street (Lot 41) purchased. This is the address where Theresa lived when she married two years later. the property was still owned by the family in 1920 when Charles Theresa’s oldest brother died there. The building still exists today (2004). In 1871 the Ninth-avenue el extended as far north as 30th Street. The riots was in remembrance of the Battle of Boyne which took place in Ireland in 1690. On July 12, the parade proceeded with protection from 1500 policemen and five regiments of the National Guard, about five thousand men. It was to begin at the Orangemen’s headquarters at Lamartine Hall, located at Eighth Avenue and 29th Street; by 1:30pm the streets from 21st to 33rd were full of people, mostly Catholic, and mostly laborers, and both side of the avenue were jammed. The police and militia arrived, to the disapproval of the crowd, and the small contingent of Orangemen began their parade down the avenue at 2pm, surrounded by regimental units. Almost immediately the crowd began to pelt the paraders with stones, bricks, bottles and shoes, and militiamen responded with musket fire, which brought pistol fire from some in the crowd. The police managed to get the parade moving again by charging the crowd and liberally using their clubs. The parade progressed another block, but came under fire from thrown missiles again, once again provoking militia shots. The crush of the crowds preventing more forward motion, police used their clubs and the militia their bayonets, but rocks and crockery pelted down on them from the rooftops along the avenue. Finally, troops starting firing volleys into the crowd, without being ordered to do so, and the police followed up with mounted charges. The parade managed to get to 23rd Street, where it turned left and proceeded to Fifth Avenue, where the crowds were supportive of the Orangemen. This changed again when the parade continued south down Fifth and reached the entertainment district below 14 Street, where the crowds were once again hostile. The parade then continued across town to Cooper Union, where the paraders dispersed. The riot had caused the deaths of over 60 civilians – mostly Irish laborers – and three Guardsmen. Over 150 people were wounded, including 22 militiamen, 20-some policeman injured by thrown missiles and 4 who were shot, but not fatally. About 100 people were arrested. Dr. Geissenhainer had been the pastor of St. Mathews Church where services were conducted in English. When his church was taken over by Christ Church, “Dr. Geissenhainer then determined to found a new organization and established the church now known as St. Paul’s. ..The First preaching was in a hall on 8th Ave. A church was erected in 1842 on the corner of Fifth-avenue and Fourteenth-street mainly through the liberality of Dr. Geissenhainer himself. It was a large and fine stone structure, and the whole property was valued not long ago at $100,000. ” NYT June 3, 1879. This is the church where Theresa was married but I can find no pictures of it today. Rev. Geissenhainer married in 1824 the daughter of a wealthy merchant named Moore. About the attendants at the wedding: Carry Meyer was probably her cousin on her mother’s side. Charles Leicht was Theresa’s older brother. Carry Flammer would soon marry William’s brother, Louie Sommer. Did Louis and Carrie meet at this wedding? William and Louie soon opened Sommer Bros Grocery. It is interesting to note that F.W. Geissenhainer was a large property owner on Long Island. He owned a lot of land in Sea Cliff, a very popular tourist resort of the day. It is interesting to note that in 1894, Rosa Gretsch took her children to Sea Cliff. Probably Theresa and her husband William also took their children there. During this same period, trolley service between the railroad station and the Village had been advocated. When plans were about completed, matters were held up by a law suit instituted by several interested parties. Two of the opponents were F.W. Geissenhainer and Judge Dailey. Their opposition seems hard to understand. Mr. Geissenhainer owned considerable real estate in the Village and Judge Dailey’s family was interested in the Sea Cliff Hotel. Both men stood to profit by better transportation. The law suit was finally determined in favor of the Village, and the trolley service was opened in 1902. Theresa and William lived at 467 Ninth-avenue from 1872 until 1879. This was also listed as a meat business in the NYCD. From 1873 till 1875 construction was going on for the Ninth-avenue elevated railroad between West 34th Street and West 42nd Street. Its construction was happening right outside their windows. It must have been noisy and dirty. March 26, Wednesday Lewis Sommer and Caroline W. Flammer are married at the same church as Theresa and William. Edward Flammer and Henrietta Flammer were the only witnesses. They were the only siblings of Caroline who never married. Caroline (Carrie) Flammer’s siblings are William G. Charles A, Henrietta, Edward, Fred, George and Theodore. Carrie’s oldest brother William married Louise Holzderber an aunt of Charlotte Holzderber. Charlotte who later married Carrie’s younger brother George. In 1860 John Holzderber and his brother Philip were “Provision Merchants”. Carrie Flammer’s father was in the meat business. The Holzderber and Flammer families were very successful in the meat and provisons business in New York. Both Louis and William Sommer both worked in this business but they were later comers compared to the Flammer and Holzderber families. At the time of her marriage Carrie lived at 901 Eighth Ave. In June of 1874 their first child, a daughter, was still born at this address. Several other children of Carrie and Lewis were born here and Lewis died here in 1895. September 19 Economic Panic begins. Carrie Flammer’s father lost his money. Johann Gottlieb Flammer was a butcher for 30 years before he retired. October 7 Susan Regina Sommer, first child of William and Theresa born. Theresa enters her name and birthday in the family Pictorial Bible. The infant is named after her mother’s mother Susanna and her father’s mother, Regina. June 20 Still born infant girl born to Carrie and Lewis Sommer at 901 Eight-avenue. ‘”We can recall no one event since the murder of Lincoln what has so moved the people as this question whether Henry Ward Beecher is the basest of men” declared the (New York) Herald. During the “scandal summer” of 1874, The New York Times alone ran 105 stories and thirty-seven editorials about the uproar in Brooklyn – and that was one of the more circumspect papers. Pamphlets, broadsides, cartoons and doggerel-ranging from serious to satirical to pronographi- poured off the presses, as well as cheap books with title like The Beecher-Tilton War and The Romance of Plymouth Church. August 10 Ten month old baby Susan died. Theresa recorded her death in the Pictorial Bible. Theresa is five months pregnant at the time of her baby’s death. Its hadt to imagine how this “summer of scandal” affected Theresa and William who were no doubt so involved with the death of their tiny daughter. January 11 Theodore Tilton v.. Henry Ward Beecher, Action for Criminal Conversation was set to begin. April 17 A second child, Louis, is born to Louis and Carrie Sommer. Father’s occupation is “Manufacturer of furniture”. Perhaps, he is working with his mother’s father and brothers. Note change of spelling of father from his wedding “Lewis”. June 14 Leopold Leicht, Theresa’s father, purchased a family burial plot at the Lutheran Cemetery on Metropolitan Ave. in Middle Village. The property for this cemetery was first purchased by the Rev. Dr. F.W. Geissenhainer. Leopold’s two oldest children were married by Dr. Geissenhainer. July 27 a mail child is Deborn to Louis and Caroline Sommer, 188222 . This must be William. August 18 Theresa and William’s third child, Theresa is born. Her mother notes the date of her birth in the Pictorial Bible but does not list the infant’s name. 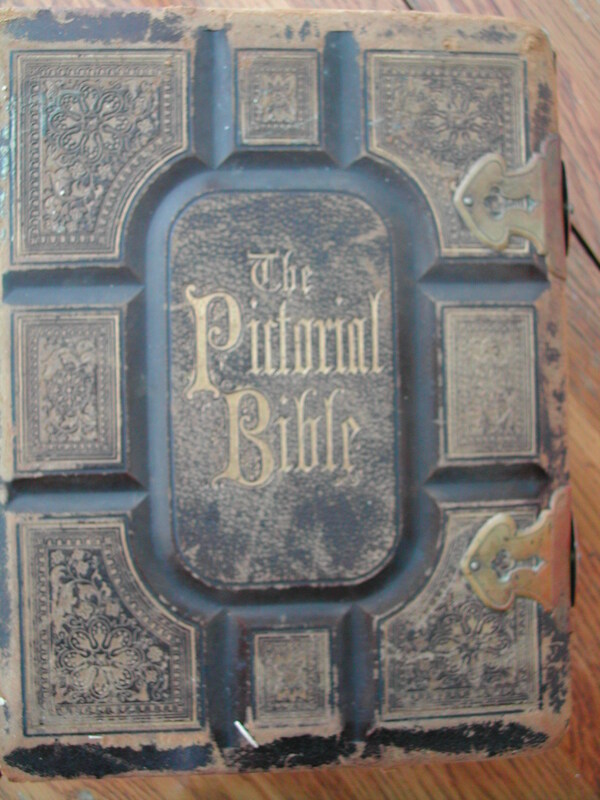 it is the last entry that Theresa makes in the Pictorial Bible. September 24 The baby Theresa, a five week old infant, dies at 467 Ninth-avenue. She is the first member of the family to be buried in the plot purchased the preceding June by Theresa’s father. September 12 Theresa and William’s fourth child William is born, 467 9th Ave. (near 37th street). Theresa does not enter this birth in the Pictorial Bible. NYCD lists William Sommer, meats, 467 9th Ave, h 400 West 36th Street. In this year, the Ninth-avenue railroad was extended above West 30th Street. Its construction must have changed the whole feel of the neighborhood. It was very noisy and dirty on Ninth-avenue where Theresa lived. By June and the birth of her fifth child, the family had moved to Sixth-avenue. According to the New York City Directory, John Leicht, Meat located at 467 Ninth Ave, home 404 West 40th . William and Theresa Sommer lived here from 1874-1879. Perhaps, William and John were in the meat business together. June 2 William and Theresa’s fifth child, Louie is born at 926 Sixth-avenue. Just the year before in 1878, the elevated train was completed on Sixth Avenue. Theresa and her family have moved to a much nicer location. The neighborhood is more residential and there is no elevated train. The Rockefellers are also buying property nearby and building homes. February 19 Jacob, third child of Eliza and Charles Leicht is born at 404 West 40th St. Father’s occupation furniture store. June 4 According to the 1880 census, Louis and Carrie Flammer Sommer were living at 901 Eighth ave.
Louis worked for a “Fish and Meat Market”. They had two sons, Louis F ( 5) and William F (4). They are living with Carrie’s parents, John G.(73) and Augusta (63). George age 23 is a lawyer and Theodore age 20, a clerk in a bank also live there. Soon, George will marry Charlotte Herzderber. There are several boarders also living at this address. June 7 According to the 1880 census, taken on June 7, 1880, the Sommer family consisted of William age 33, working in a butcher Shop, Theresa, age 28, his wife, Philip age 5, William age 3 and Louis age 1, and Margaret Ginety (sp?) age 25 a servant, from Ireland in their household. December 16 William and Theresa’s sixth child, Charlotte Susan Sommer was born at 112 West 53rd Street. Was Charlotte perhaps named after Charlotte Holzderber Flammer who was married to Carrie Flammer Sommer’s brother John George Flammer? In fact Carrie’s oldest brother William had married Louisa Holzderber possibly an aunt of Charlotte Holzderber. 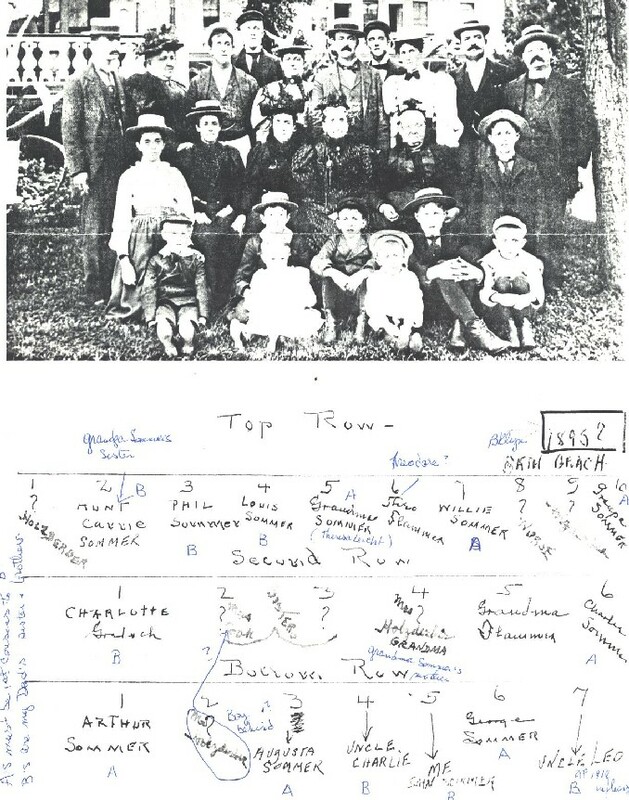 There was a close connection between the Sommer, Holzderber and Flammer families. See the picture of 1895 below. January 22 Charles Flammer Sommer born. Son of Louie Sommer and Carrie Flammer. Aug. 11 Bella , fourth child of Eliza and Charles Leicht is born at 529 9th Ave. Unlike Theresa and her husband, Charles and Bella were not able to escape the Ninth-avenue neighborhood. Dec 3 Four month old Bella dies. She is buried with her tiny cousin, Theresa Sommer and Johanna Knoop. George Sommer born to Louie and Carrie Sommer. December 1 Eliza Leicht dies at her Ninth-avneue home of Tuberculosis. She is laid to rest with her daughter Bella, her niece Theresa and Johanna Knoop. Dec 16 Theresa’s mother in law,Regina Winklein Sommer dies. At the time of her death, she was living with her youngest daughter Anna at 1658 Lexington Ave.
December 17 Theresa’s father, Leo Leicht died. November 22 Property on West 39th Street, Lots 28 & 29 are sold to John and Charles Leicht from the estate of Leopold. Theresa Sommer came into some money. September 14 Theresa’s mother, Susanna Meyer Leicht dies at 404 West 40th Street. November 2 More property is sold from the estate of Susanna Mayer Leicht. Two lots on Ninth-avenue are sold to Leopold and John. The house on West 40th Street is sold to Charles Leicht. Again Theresa would come into some money. February 18 Theresa’s nephew George Moeller dies. He was 35 years old. His mother is the sister of William Sommer. May 19 Louis Sommer, brother of William Sommer dies. No death certificate can be found. Perhaps, Louie didn’t die in Brooklyn as the cemetery records indicate. He is buried at the Lutheran Cemetery in Queens in a plot purchased by his wife, Carrie Flammer Sommer, a few days after the burial. This suggests to me that he died suddenly. Caroline had several very successful and prosperous brothers. No doubt they helped her in the care of her children. Louie’s brother and business partner William Sommer would have also helped in taking responsibly for Louie’s grown and growing children. Also, he would have taken charge of the grocery and butcher business which the brothers shared on Sixth Avenue. In a similar way 50 years later, William and Theresa’s grandson Fred was left as guardian of his brother’s children when Bill died of cancer in 1948. Fred also assumed responsibility of the music business which the brothers had previously shared leadership of. The role of the woman is here unclear. How did Carrie fare after the early death of her husband? How did Theresa respond to the added responsibilities of her husband. This picture gives some clues. Dated “1995”, it shows a close knit family of cousins, aunts and uncles and grandparents. Louie is not in the picture. There are several members of the Flammer family present and identified. A younger brother of Caroline Flammer Sommer, J. George Flammer, married Charlotte Holzderber in 1880. Pictured here are several older women named Holzderber. years later, when Leo Sommer (the small boy in the lower right hand corner) was married in 1914, William Flammer was one of his ushers. William Flammer was the son of J. George Flammer and Charlotte Holzderber. December 4 William Sommer purchases a family plot in the Lutheran Cemetery. 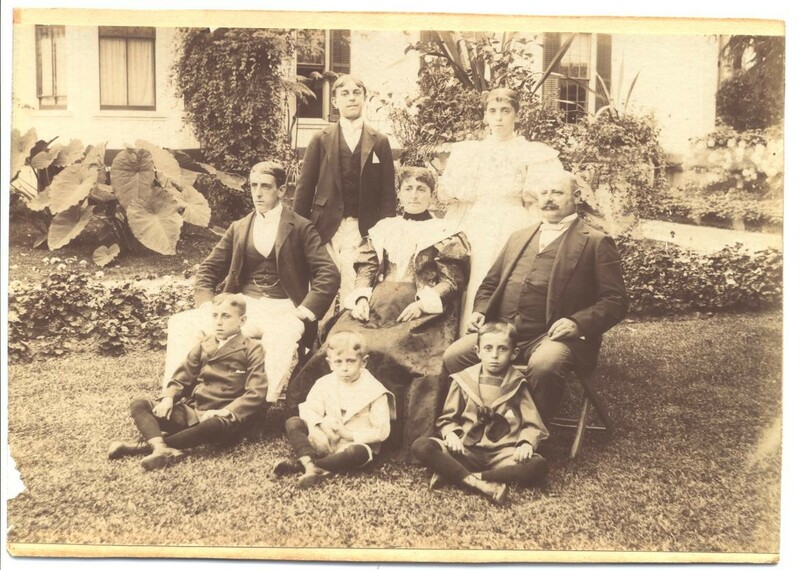 Click on this image to see an enlargement Theresa and William Sommer and their children around 1896. This picture is taken outside which is unusual for the time. This virtual picture was given to Gretchen Elsner-Sommer in May of 2005 by Barbara Sommer Shea. Gretchen is the granddaughter of Charlotte Sommer and Barbara is the daughter of John Sommer. September 30 Grand events in NYC around the Spanish American War and the victory march for Admiral Dewey. Young men going to War. Were her sons considered. Louie, Philip or her nephews, Carrie’s Children Louie, Philip, ? This was the beginning of American imperialism. Big doings in the newspapers about this war. Remember the Maine. Elizabeth’s (sister of William) husband Charles Kruger dies. July 20 Theresa first grandchild, Charlotte Sommer, daughter of Philip and Augusta Sommer is born. Theresa purchases a plot of land in the 200 block of W. 54th Street. January 20 Theresa’s only daughter, Charlotte married Fred Gretsch in Theresa’s and William’s home. It contrasts greatly with the large wedding that Theresa had when she married Charlotte’s father in 1872. Is this because Theresa’s parents were much wealthier than Charlotte’s parents, Theresa and William were. Both Charlotte and her mother were the only daughters and each had several brothers. Like Theresa (Carrie Meyer), Charlotte would have her cousin Clara Schmidt in her wedding party. Just months after Charlotte’s wedding, tragedy struck New York city. Disaster aboard the GENERAL SLOCUM. This pleasure boat was hired by St. Mark’s Lutheran church to carry parishioners to a church picnic. Over 1000 people mostly women and children were killed. Is this perhaps, the event which caused Charlotte and her mother to change their religion? Before, the disaster records show that both Charlotte and her mother Theresa were Lutherans. Afterwards both women and after she was Catholic. This was the biggest disaster in NY to date, and it certainly hit home to all the Germans and Lutherans in the city of which Charlotte and her family were a part. March 10 Theresa’s grandson, Fred Gretsch Jr, is born at 178 Nostrand Avenue in Brooklyn. Theresa’s granddaughter Clara Marrita daughter of Louis and Clara is born. Clara Marrita died on August 5, 1923. December 13 William Walter Gretsch is . He is Charlotte’s second son. Feb.12 Theresa’s granddaughter, Charlotte Sommer died of diptheria. She is 11 years old. Feb.27 Harold Gretsch born, son of Charlotte and Fred.